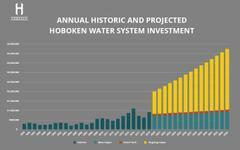 Mayor Ravi S. Bhalla today announced that the City of Hoboken and SUEZ have agreed to a new water service contract that would invest at least $33 million in water infrastructure upgrades through 2034. The new contract, which is subject to City Council approval, establishes a new public water utility and includes an average of $2.2 million in water investments per year, over six times the amount of the current contract. The new agreement was based upon the framework of the initial SUEZ negotiations led by former Mayor Dawn Zimmer and her administration in 2017. The agreement with the City and SUEZ calls for the establishment of a new water utility. The revenue from the bulk water consumption would then be placed in the new water utility, and the City would then reinvest the majority of the revenue into water main upgrades. The water system would no longer be operated as a private water concession, but instead as a new public water utility. SUEZ would continue to maintain and operate the water system, however all revenues generated from water bills would be invested by the City as opposed to SUEZ. 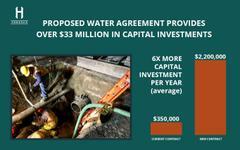 An average of $2.2 million, over six times the amount required in the current contract, would be invested by the City each year for water main upgrades according to the contract, which includes $1.5 million in proactive upgrades and $700,000 for maintenance and repairs. Additionally, the contract also includes $2 million in smart leak detection technology, which will record water consumption data in real-time to detect leaks. Under a contract and several extensions negotiated by a prior administration beginning in 1994, several multi-million upfront payments to the City were used to fill budget deficits and were not invested into infrastructure upgrades. The previous agreement required only $350,000 per year for capital repairs and upgrades, which has been substantially insufficient for even emergency repairs. Under the terms of the new contract, at least 18% of the City’s water mains will be upgraded by 2034, while the old contract upgraded only 5% of the system from 1994-2017. In addition to the renegotiated contract with SUEZ, the Bhalla administration and the former Zimmer administration have independently invested over $17 million in water main infrastructure upgrades through the City budgeting process. This includes $7 million for the complete replacement of century-old water mains along Washington Street and a combined $10 million in water main replacements in identified priority areas. $5.2 million of these replacements will begin construction this summer.